Hi,How cozy!!! And what a wonderful privilege! I LOVE jars! (I will confess to owning a jar glued to a candlestick...my best girls and I each bring our "fancy glasses" to Girls' Night to drink wine out of!) I pinned these on Pinterest and when my husband saw them he asked when I was making us a set! I have 4 kids, so I think a set of 6 in different colors will be a big benefit around here! Great job (as usual!!)! Hi Dawn! How wonderfully delightful! 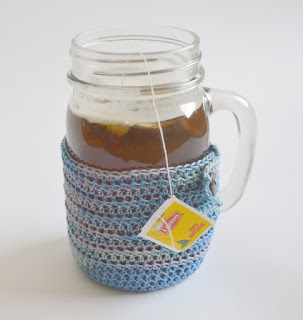 I love using cozies to avoid cup confusion! Everybody gets a color and nobody gets to complain! (Part Reservoir Dogs, part Weasley sweaters!) Totally jealous of your mason jar wine glass! LOL!